This Christmas I made a special present for my mom and the grandkids. For these tail I found this wonderful idea from Vixen Made. I followed her tutorial except I couldn't find the name tags. After a short trip to the thrift store I found a pair of suspenders. The clips on the ends worked great. Now I need to make some more to keep at our own house. Simple felt flowers sen to a band of material. 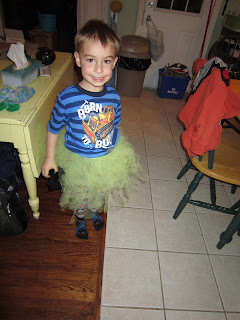 I also made this tutu for TJ. He has had so much fun playing dress up, so I made something to go with his wings. It is made from tying little strips of tule around a length of elastic. My next step is to properly set up our dress-up area with a mirror and hooks.